Los Angeles—The San Francisco Public Defender’s Office was honored with the prestigious “Champions of Public Defense” Award on Friday from the National Association of Criminal Defense Lawyers (NACDL) for its work on behalf of bail reform. The award was presented at NACDL’s Race Matters II Conference in Los Angeles and recognizes “an individual or organization for exceptional efforts in making positive changes to a local, county, state, or national public defense system.” The Civil Rights Corps also received the award. “Finally, bail reform has become a central focus and concern with the criminal justice system, due in no small measure to the dedicated that has been spearheaded by both the San Francisco Public Defender’s Office and the Civil Rights Corps,” said award presenter Nan Whitfield, Vice Chair of NACDL’s Public Defense Committee. 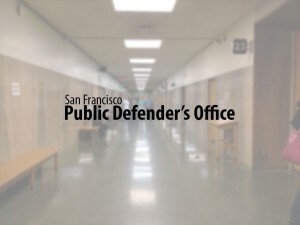 The San Francisco Public Defender’s Office has been vigorously challenging pre-trial release practices in California. Recently the office appealed the constitutionality of existing bail practices to the state supreme court on the grounds that they are unfair and fail to consider the financial circumstances of the accused. “The current money-bail system clearly favors those who can afford it over those cannot,” NACDL President Drew Findling said in a statement released after the awards. “This award is presented as both a recognition of their tireless work toward ending inequality and for the success they have achieved in reshaping our criminal justice system,” he said. Public Defender Jeff Adachi and Deputy Public Defender Chesa Boudin accepted the award at the event, but they acknowledged the other people at the Public Defender’s Office who have assisted in this fight, including Deputy Public Defender Armando Miranda, research manager Chris Gauger, policy analyst Donna Mandel, and paralegal Marcy Diamond.